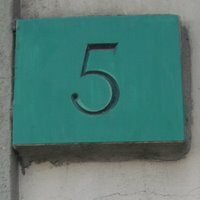 orinda5: Three Years for the Budlet! The Bud was the "birthday Bud" today. Although the actual day was yesterday - we had a little party today. 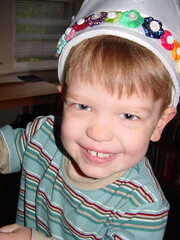 It's so hard to believe my sweet, little Budlet is now such a sweet, big Kidlet. 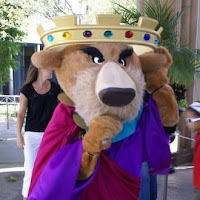 He was prince Budlet for most of the morning in his new crown - I thought he looked a little like Prince John from the Robin Hood cartoon when it got pushed down on his ears. 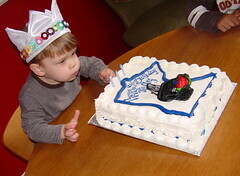 A few weeks ago we asked the Bud what kind of cake he wanted for his birthday. 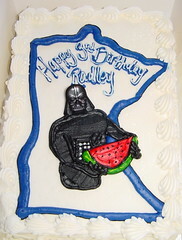 He replied, "The shape of Minnesota with Dark [sic] Vader" - a little later he added "with a watermelon". 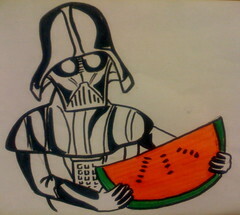 He was so serious, and the answer never changed - except for the addition of the watermelon - that we just had to oblige. The whole thing cracks me up quite a bit. I still like the original sketch the best. Darth Vader is a licensed character, so the bakery wouldn't copy the fabulous drawing D's coworker did for us, but they would use a plastic Vader ring for his head and create his body in frosting. I think the original drawing would look great on a T-shirt. Hmmm. Hey, D - didn't you used to do screen printing? The Bud liked it all the same, and kept opening the fridge to peek at it all morning. There was much running and playing and general merriment with cousin K up until the big nap time crash. I think "fun was had by all." I have been spending some time lately finishing up some long time WIPS. 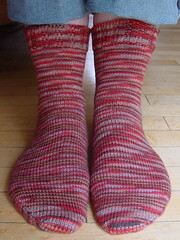 I started these socks for a long car ride to a family reunion early this summer. I was using these to try to improve my short row heels. I tried two different approaches - one used YOs and one used wraps. The wrapped heel turned out a bit better. For the wrapped heel I tried knitting back and forth (no purling) first left handed and then right handed. It made it a little easier for me to figure out exactly how to mirror the wrapping, and improved my right handed knitting - not that I am planning on switching. 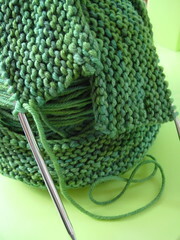 My left handed knitting and purling is far faster and more natural for me. 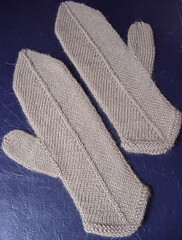 The other WIP I FO-ed recently was a pair of Mitered Mittens made of yarn leftover from my Clapotis. I was thinking about doing a tiny bit of embroiderey on them, but part of me likes them plain too. Either way I'm sure I will be putting these to good use soon. Part of the reason I was pushing the FOs was to let myself start something new without so much guilt. OK, that cake is hysterical! I hope my daughter is as hilarious when she turns 3! What a freakin' cute cake...and the story that goes along with it is PRICELESS!! I love the stuff that kids say and I think it's really sweet that you obliged. 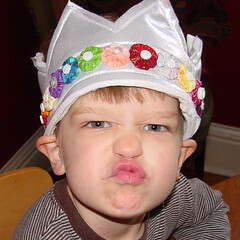 Happy bday to the Budlet - my Hunterman will be 7 next weekend! I LOVE the cake! It is fantastic!